By Amanda Tonoli | January 30, 2018 at 12:05a.m. Joshua Dixon Elementary students are jumping for the American Heart Association this week in their physical education class. Students who donate money get to participate in a number of jumping activities for charity. In this case, it’s for Jump Rope For Heart. 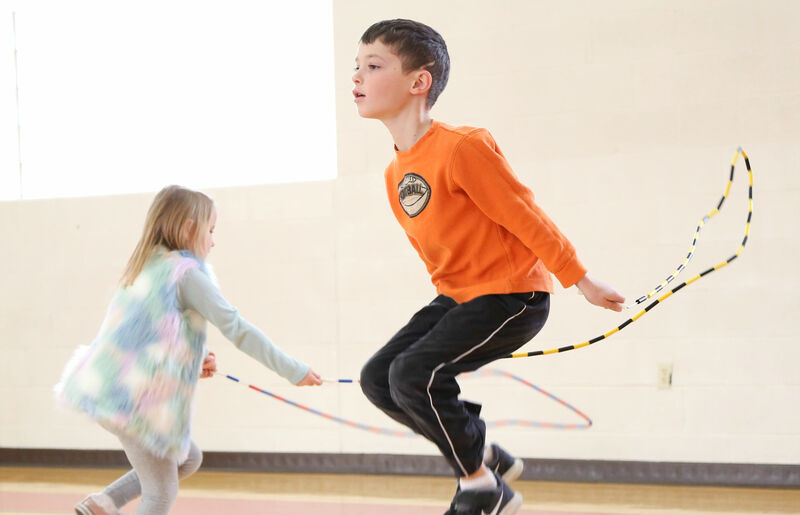 Jump Rope For Heart helps students “learn the value of community service and become empowered to contribute to their community’s welfare,” according to the AHA’s Jump Rope For Heart website. “We talk about why we donate money and how it’s important to help kids their age,” said Courtney Schiffauer, physical education teacher. Seven-year-old Patrick Tofil, first-grader, said he enjoys donating to those in need. “I like being able to give money to people if they don’t have anything or any money,” Patrick said. Fellow first-grader Riley Fisk, 6, echoed Patrick’s sentiment. “I like Jump Rope for Heart because it helps children in the hospital,” she said. Riley said she relates to children in the hospital after she had an emergency-room visit after a fall. Not only do students benefit from learning about the heart and the AHA, but students are also getting some extra physical activity, Schiffauer said. To best engage her students, Schiffauer set up multiple stations for different jumping activities – jump ropes, ladder jumping, skip jumping, ball jumping and a stretching station. “It makes it so they don’t just have one thing to do like jump rope because that can get very exhausting,” she said. Joshua Dixon had 50 members registered as of Monday and raised $1,475. Students have also completed 18 daily challenges of exercising 60 minutes a day, 21 daily challenges of choosing water over sugar drinks, and 10 daily challenges of fruits and veggies at every meal. For information or to donate to the cause, visit american.heart.org/jump-hoops/. March 24, 2018 12:01 a.m.
January 28, 2017 12:02 a.m.